I just started to play on DGS. I was teaching here during several years, but I never played any dan-level opponents before. Any way, I found near 10 opponents and I hope to improve my rank a bit. Dan-level DGS players, please challenge me, if you have free time! Can you write us something about OGS and OGS stars? I couldn't find here any news from OGS. 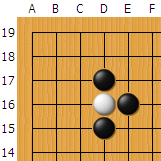 Have you considered playing on OGS too (www.online-go.com)? They have a friendly community, much more sociable than DGS and a game review feature. I play there as davos. One advantage is that OGS is actively administered (unlike DGS).